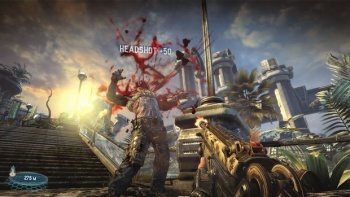 Today's the day that Bulletstorm finally hit store shelves and you know what that means - it's DLC time! With People Can Fly's long-awaited follow-up to Painkiller finally out and making a big splash with reviewers, Epic and Electronic Arts have now announced the game's debut DLC release, the Gun Sonata Pack, which will open up a whole new range of opportunities for amazing team skillshots across three new Anarchy multiplayer maps set in the Sewers of Stygia, the ruins of Hotel Elysium and the wide open spaces of Villa. Also included are two new Echo mode mode maps: "Crash Site," in which Final Echo soldiers must deal with the ramifications of their crashed ship, and "Guns of Stygia," featuring a captive commando busting out of an enemy prison. Last but not least, the DLC pack will come with two Leash enhancements, the Flamingo and the Pulp, "making it even more enjoyable to kill with skill and style," although what they'll actually do is anybody's guess. The Gun Sonata DLC pack is set to come out this spring and will sell for 800 Microsoft Points on Xbox Live or ten bucks on the PlayStation Network. UPDATE: The original announcement didn't mention it but Epic has since confirmed that the Gun Sonata Pack is coming to the PC as well, although distribution details were not revealed.